Davidâ€™s long relationship with Pete Cornish dates to early 1976. Pink Floyd was just returning to the studio to record Animals and David needed a new board for his increasing amount of effects. Also, the shows had grown bigger and the music more complex. This demanded a board that could sustain the signal with a minimum tone loss and not least, provide Gilmour with an easy access setup without all kinds of messy cables and dying batteries. Although the board has been well documented over the years, some of the info is conflicting and sometimes even plain wrong. In this article I will try to document the different versions of the board and hopefully put some rumours to rest. - The Pete Cornish effects board pictured during Pink Floyd rehearsals at the Olympia Exhibition Hall in London. Notice the addition of an Electric Mistress (left) and a Big Muff (right). The big pedal to the left of the board is a Morley EVO-1 echo unit and the little one in front is a footpedal for the Yamaha rotating speaker. 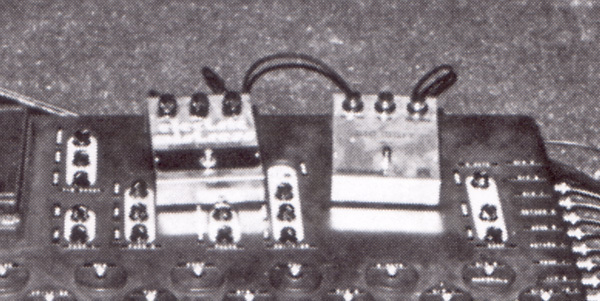 David got his first pedal board in early 1973 for the Dark Side of the Moon tour. Up until then, he had just used a couple of basic effects lined up on the stage floor. The board included a Fuzz Face (silicon BC108), Colorsound Power Boost, Univox Uni-Vibe, MXR Phase 90 (added in 1974), Vox wah wah and on/off switching for the delays connected via send/returns. Read more here. According to Pete Cornish’ own schematics the new board dates from March 7. 1976 and construction began June 3. Keeping in mind that effects boards being a fairly new thing at the time, Cornish had already been making boards for Robert Fripp, Steve Hacket and Phil Manzanera (among others). It was probably David’s first guitar tech, Chris Adamson, who initiated contact with Cornish (Phil Taylor joined as backline tech in 1974 and became David’s guitar tech sometime in ’76). 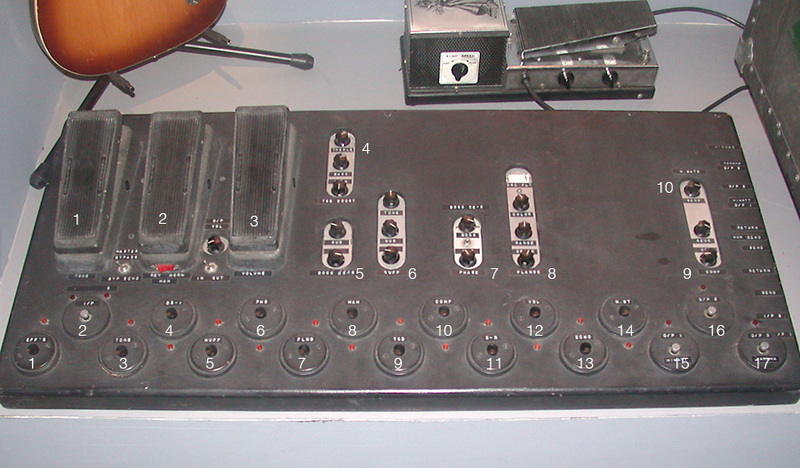 The board was used during recording sessions in autumn 1976. The board had two inputs for guitars (input is selected with an on/off selector pedal). The signal is then split, – into a Conn Strobo tuner and a master bypass. The signal travels through the effects (as described in the list above) and then to three outputs for amps, either in solo or combined. Also, the Cry Baby had a custom switch on its heel for reversing the connection for the “Echoes seagull squeals”. After the recording sessions finished in November 1976, Pink Floyd started rehearsing for the tour in their Britannia Row studio and later at the Olympia Exhibition Hall in London. During these couple of months, the board went through some minor changes. The Tone pedal was placed in front of the volume pedal and a Colorsound Power Boost was added, placed between the Uni-Vibe and Cry Baby (see comments below). Pictures taken at the Olympia Hall (Animals songbook) also show a EH Big Muff â€™73 â€œRamâ€™s Headâ€ and an EH Electric Mistress ’76 model lying on top of the board, connected via send/return (see comments below). - A closeup of the two Electro Harmonix pedals connected via send/return, - Electric Mistress (left) and Big Muff (right). These two pedals was built into the board in October, after the tour had ended (see details below). 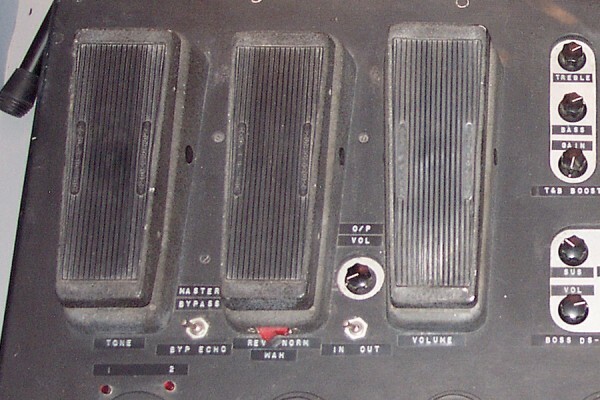 Both the Big Muff and the Electric Mistress was added during rehearsals in late 1976, connected via send/returns, lying ontop of the board. Both stayed on for the tour and was built into the board on October 25. 1977, – some three months after the tour ended. The Muff replaced the Cornish Fuzz and the Mistress replaced the Uni-Vibe. The Phase 100 was used only on a couple of concerts early on the tour. In late October 1977 (after the tour), it was replaced by a MXR Phase 90 and an Electro Harmonix Small Stone. A small toggle switch was also added so that Gilmour could switch between the two phasers. In an interview with Guitarist in ’95 Cornish says â€œâ€¦ and we added a treble and bass boost, which I think was a Colorsound unitâ€¦â€. Also, in Fitch and Mahonâ€™s book â€œComfortably Numb, a history of The Wallâ€ Phil Taylor lists a Colorsound Power Boost as the original booster unit in the 1976 version of the board. This certainly confirms that a Colorsound Power Boost was used during the tour. However, according to Brian Clem’s interview with Cornish (Guitar World 2006), a Cornish ST-2 treble and bass booster repleaced the Colorsound in October ’77, – three months after the tour. This indicating that Gilmour used the ST-2 on his first solo album in ’78 and later on The Wall album and tour. (left, rehearsals & tour 1976-77) Colorsound PB, Fuzz Face, Cornish Custom Fuzz (labelled â€œMuffâ€), Phase 100 and Uni-Vibe. (right, modifications Oct 1977) Cornish ST-2, Fuzz Face, Big Muff, Small Stone (top)/Phase 90 (bottom) with the toggle switch and Electric Mistress. The Animals board was used on the recording sessions for David’s first solo album in 1978. The board is also seen on the five live promo clips recorded at the Super Bear studios in France, clearly showing that the Mistress and Muff are built into the board. For the recording of The Wall, David had a new Cornish board, which was a little smaller than the 1976 board. â€“ read more here. The â€™76 Cornish board was again used for the Wall tour in â€˜80-â€™81. – Guitar World (December 2006). Big thanks to Brian Clem for sharing his research files.